This safety bed rail works well as a side rail to keep your from falling out of bed and as a support bar for getting in and out of bed. Includes a bumper pad with an 8-pocket organizer pouch that is perfect for keeping handy items close by. The rail folds down and out of the way when it isn't in use. Attaches to any size home or hospital bed with included dual safety strap and at 23" high will accommodate taller pillow top mattresses. 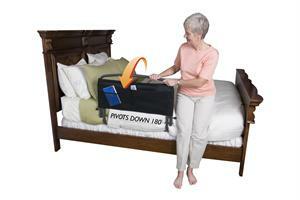 This safety bed rail is perfect for senior home care or for anyone who needs extra security and convenience in bed.